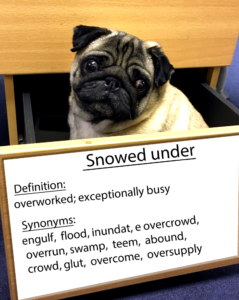 Snowed Under, Idiom of the day! Sorry Harry has been a little quiet at the moment he has been a little snowed under at the moment! He thought he would share his Idiom with you! Look, I’m really snowed under at the moment. Can this wait? He really has been snowed under with work.